Every once in a while, I have to get out of Los Angeles. A weekend away is the best way to recharge! 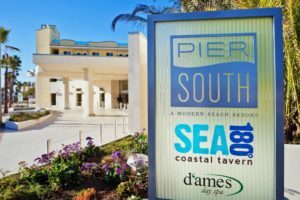 So when I was invited to check out Pier South Resort in Imperial Beach, California, just a few miles from the Mexico border, I jumped at the chance and it turned out to be the best kept secret in SoCal. Driving through the small surf town of Imperial Beach, my daily stresses already started to dissipate and my min d went into full vacay mode as I pulled up at the stunning beach front property. The resort is one of the only hotel’s in town along a quiet strip filled with quaint restaurants and vacation rental properties. The backside of the hotel looks out o nto crystal blue water and a stunning pier which houses the seafood heaven Tin Fish Restaurant. 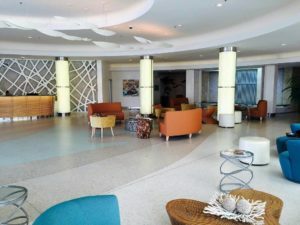 Walking into the lobby, you are immediately struck by the mix of beach resort style and modern clean design. The hotel includes 650 square feet suites with separate living areas, private balconies, and scenic surroundings of the dramatic ocean views outside the back door. Each room features custom items including sh utter blinds, ceiling fans, 300 thread-count linens, plush euro-top bedding, and 42’ HD flat screen television graces the interiors. The spa inspired bathrooms offer upscale bath amenities from Gilchrist & Soames and lavish bathrobes with slippers, a stocked mini bar, and complimentary high-speed internet. When I walked into my room I felt like I was entering my own beachside apartment rather than a hotel space, and I was immediately drawn to the balcony where I took in the smells and sounds of the ocean. 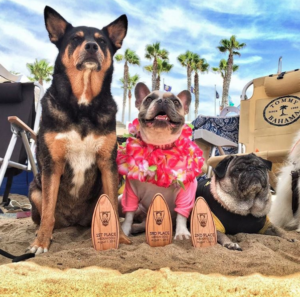 I would have never left except that I could not wait to get down to the beach itself where their was a surf dog competition going on…yes you read that right, adorable dogs on surf boards. hungry viewers and pets alike. Proceeds from the event estimated to be $7,500 benefited the San Diego Humane Society. I can pretty much say for certain I can never enjoy the beach the same way again without adorable dogs floating by! Once back at the hotel, which is a LEED Silver certified property featuring solar heating and cooling technology, I could really explore the amenities! The beachside pool was simply stunning and the perfect alternative for anyone who wanted to cool down sans the sand. I made a mental note to return to the hottub late night. The D’ames Spa offers guests services including 50 or 80 Min In-Room Coconut Sugar Scrub or Polynesian Noni Body Wrap, Brazilian Propolis facials, Swedish or Deep Tissue Massage, and even waxing (Bikini, Brazilian, Brows) and more! Once my pampering needs were met, I headed back to my room to get ready for dinner at the hotel and the live jazz concert that evening. The hotel’s coastal tavern SEA 180º offers 180 degree views of the Pacific ocean. The inspired Baja-Med menu features culinary creations including Mexican cuisine influenced by the original colonizers of the area. Led by David & Lesley Cohn of the Cohn Restaurant Group along with Partner and Executive Chef Ken Irvine, the menu includes exceptionally prepared, fresh seafood and local produce as well as shared-plate offerings. The imaginative, restaurant design is by famed designer Philippe Beltran. Guests enjoy indoor dining under sky-high glass windows which highlight the restaurant’s design focal point; the picturesque sea views, as well as Alfresco dining on the expansive restaurant patio complete with decorative fire tables. Be sure to try their Caramelized Pineapple upside down cake for dessert! The evening’s concert featured a performance by No Pals jazz band from Mexico featuring members Victor Loyo, Lalo Carrillo, Alex Carballo, and Salo Loyo. Talk about a seriously talented group of musicians. There is nothing like seeing live music on the beach, under the stars, but these guys would blow you away if they were playing for you in their garage. Luckily, they are miles from that, as the group has been successfully touring together for many years! The crowd was singing and dancing along and included the town’s mayor Serge Dedina who gave a brief welcome speech and highlighted that Imperial Beach is a place that is building a bridges between borders, not walls, and was happy to have guests from both sides of the border in attendance. I caught up with the mayor after my stay to talk about the work he is doing in the Imperial Beach community to make it an important cultural city in Southern California. 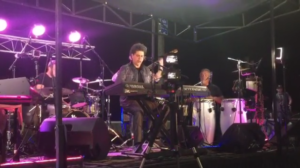 The town hosted the binational festival Fiesta del Mar featuring binational food, music and artists earlier this year. Additionally, they are using wellness as a foundational element of tourism and community development strategy with a huge celebration of Global Wellness Day, a crossfit competition recently, and the upcoming Ironman 70.3. Serge also developed a partnership with the fine arts school at SDSU to showcase their symphony orchestra, an upcoming concert which will happen in October. Local Cali band Switchfoot recently played a free show on the pier and Serge is currently working on scheduling a similar event with the band P.O.D. Before departing Imperial Beach I took a long walk along the sand toward the south and came upon the Tijuana River National Estuarine Research Reserve. The ocean side is part of the Tijuana River Mouth State Marine Conservation Area. I learned the area is home to leopard sharks, gray whales offshore and a very large population of bottlenose dolphins. The area is also known for nearly 40,000 elegant terns living in the South San Diego Bay Wildlife Refuge, on Imperial Beach’s northern border which fly over the beach early in the morning on their way to feed. On the way back to Los Angeles, I made a quick stop to nearby Coronado Beach and its shops, just a few miles up the rode and then stopped in downtown San Diego just a short drive from Pier South hotel for lunch. Pier South is truly a blend of beach life, wildlife conservation, good food & live entertainment and just far enough from Los Angeles to make you feel like you’re enjoying a Mexican vacation without crossing the border. 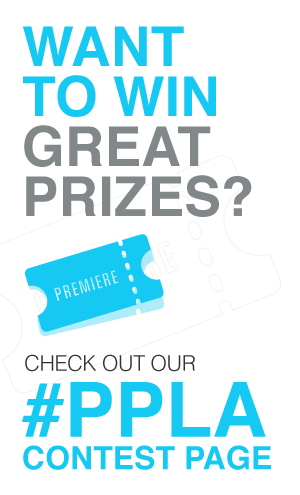 It very well could be the best kept secret in Southern California…but not for long! So be sure to visit Pier South Resort soon.